Conflict is a part of any work environment. It can’t be helped. When you have a group of people working under stress with different personalities, there’s bound to be a few problems. That conflict exists is not the issue, but having an effective conflict resolution strategy to resolve that conflict if it begins to impact the business is crucial for any manager. While conflict can be a creative fuel that helps teams compete and work more productively, it can also easily blow up and bring everything to a dead stop. But how do you defuse a situation that is lit by anger and other emotions that are not responsive to rational engagement? It’s not easy, but there are ways. Here are 10 conflict resolution strategies that can help you manage volatile team members. Before there is any hint of a conflict, you can reduce or even eliminate potential problems by setting a standard of behavior in the workplace. If you give the team the room to define what is and is not appropriate, they will. However, as a manager it’s your responsibility to set the tone. You can do this by writing specific job descriptions, creating a framework for how discussions are run, noting the hierarchy and who is responsible for what, defining proper business practices, choosing which project management tools to use, helping with team building and leadership development, etc. The more you set the guidelines, the better the team can follow them. Depending on the type of person and manager you are, there are several ways you might respond to conflict in the workspace. For one, you could ignore it, and let the participants work it out among themselves. This is not always the worst approach. Teams must know how to collaborate, and conflict resolution is one of the tools they’ll need to do that. However, if you’re avoiding dealing with conflict because it makes you uneasy or because you don’t want to reprimand someone, then that’s a misstep. Of course, it’s your job as manager to deal with such matters. You have the authority and should act when it is called for. Not to do so only gives the conflict legs on which to carry itself to a confrontation that will have an even worse impact on business. One of the first steps to diffuse any conflict is to change the environment. People are heated and that anger is often tied to a place. It sounds odd, but just removing the people from the room they’re fighting in will help put the conflict in perspective. Then, to resolve the conflict, you’ll want to bring the upset individuals to a neutral location. A neutral space will first bring things down to a level in which a constructive conversation can occur. Secondly, by suggesting a meeting in a coffee house, or anywhere outside the office where there isn’t intrinsically a power dynamic, you are more likely to create a comfortable atmosphere where you can productively deal with whatever caused the issue. After you’ve broken away from the place where the conflict arose, you can address the problem. But you don’t want to jump right into a conversation with an accusatory tone. Your job is to hear all sides and make an executive decision based on the facts and the needs of the work being done. Therefore, to get a person comfortable enough to talk, start by complimenting them. You want to show that there is no bad guy or good guy here. You’re attacking the problem, not the person. The reasons for any conflict are often more complex than they first appear. In order to be just in your treatment of all parties involved, it is advised not to conclude anything at the offset. Even if you think the conflict is obvious, give everyone an opportunity to share their perspective. Get a sense of the history involved. You don’t want to assume anything about anyone. Gather your facts like a quiet detective, and then weigh in with the wisdom of a judge. While some conflicts are going to require consequences, most are just sparked by passionate people coming at a situation from different vantage points. The truth is that when conflicts arise, so does the opportunity to teach or learn. Being a manager is seeing these conflicts as a means to address what were previously hidden problems within the team dynamics. Another thing to think about as you address conflict in your workforce is not jumping to just righting the wrong. What that means is there could be an obvious reason for the conflict and a similarly clear way to get people back on the same page working productively. You’re leading the group, not taking sides in their arguments. It’s best if you can get the team to work together to resolve the conflict. That means taking more time to guide them to the conclusion you see, but they’re too emotionally involved to notice. In any conflict there are a multitude of approaches, some more critical than others. But sometimes things are plainly wrong, and criticism is the only valid way to deal with it. Be that as it may, the people you’re criticizing are the same people you’ll be working with tomorrow and next week and so forth. So, how do you criticize without embittering, so you can still effectively lead? That’s where constructive criticism comes in. It’s an approach that allows you to address the issue and lay blame, but also support the good work that was done. You offer guidance, so that the problem can be fixed. The team now has the tools to avoid repeating it, and no one is resentful. As a manager, you’re in a position of authority. Don’t abuse it. It might seem like the simple fix to coerce the correct course, but that is not thinking in the long-term. The team never learns anything from this but to fear you, which means they won’t confide in you when something starts going wrong, leaving you in the dark until the issue is possibly beyond repair. So, take the time to work through your conflict resolution in such a way that it doesn’t pop up again the next day. Remember, you want to put the time into conflict resolution to do it right. But once you have gone through that process, then it’s time to act, and you should do so decisively. Don’t let the decision wait and leave the team lingering. It sets a bad precedent in terms of your leadership. You’re leaving a void at the top, which will get filled by ideas other than your own, and you may lose the authority you need to lead. So, when you come to a decision, act on it. Some might not like it, but they’ll at least know where you stand. 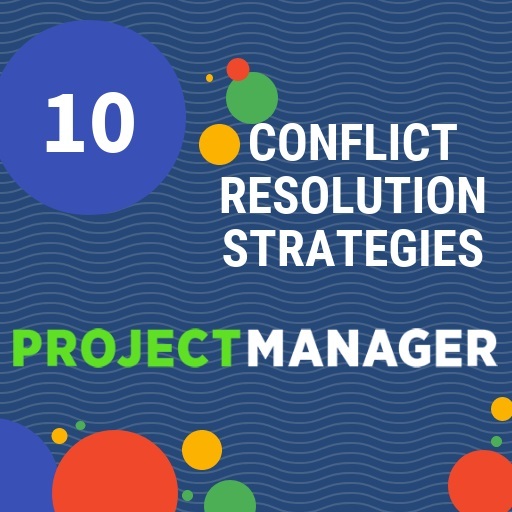 If you’re feeling conflicted about what is the right project management tool for you and your team, then ProjectManager.com has the resolution. Our cloud-based software has a real-time dashboard to help you keep an accurate eye on progress and online Gantt charts to make scheduling transparent, keeping everyone aware of what tasks are theirs and when they’re due. See how it can remove conflict from your work life by taking this free 30-day trial today!